The beginnings- In early times, “Anglo” settlement of Texas was often brought about through grants awarded to “ernpresarios,” “land agents” who entered into agreement with the State (Mexico, or the Republic or State of Texas) which granted land under the condition that the empresario’s company settle the land. 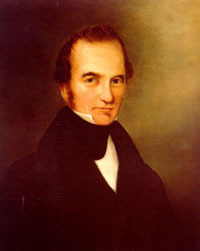 The most famous of the empresarios was Stephen Fuller Austin, whose original 1821 agreement with the Mexican government to settle 300 families in southeast Texas-the “old three hundred”- was fulfilled and augmented by this and other grants to such an extent that by the time of the Texas Revolution (1835) as many as 30,000 settlers had come to Texas. In 1841, the Republic of Texas negotiated a land grant with the Texas Land and Emigration Company led by William S. Peters, an English-born Louisville, KY music store owner, who, incidentally, published the songs of Stephen Collins Foster. The “Company” was composed of twenty investors, eleven from England and nine from the U. S. A.. The initial grant was comprised of a 22 mile-wide strip of land from the Red River, (plate 1) which included approximately the eastern half of Denton County. Over the next several years, the contract between government and colony was modified several times, which changed its duration and greatly increased the amount of land involved, east, west and south. Upon the expiration of its “patent” in 1848, the Peters Colony became engulfed in acrimonious turmoil, because when the Peters Colony mandate expired, a family could obtain 640 acres directly from the State without paying a “commission” in land to the Colony’s management, as had been the practice. During this time, a “delegation” of settlers descended on the Colony’s headquarters and drove out its manager, an officious Englishman, Henry 0. Hedgecoxe (Hedgcoxe’s War). Without doubt the State of Texas got what it needed- a nucleus of settlers; the beginnings of infrastructure; county government; a few stores; and sufficient populace to keep the Indians under some semblance of control and at the least, the beginnings of the creation of demand for services- cotton gins, mills, blacksmith shops, and so on. One might view the fact that the first settlers in doing business with the management of the Peters Colony on less favorable teims than later settlers, in essence paid in advance for the services and infrastructure to come. In fact, the Peters Colony provided the settlers with necessities such as powder, shot and seed, and in some cases, even construction. Later settlers supplied their own.. It took about two decades, into the 1870s, before all the deeds involving the Peters Colony had been perfected. However, for the founders of Lewisville Lodge, this history was of little consequence because none arrived much before the early-to-mid 1850’s, and thus they would have obtained land titles directly from the State, or from even earlier settlers or speculators. A list of voters in Denton County recorded in 1850 contained less than 100 names, indicating that the rapid growth of the County (founded in 1846) lay in the future. Given that land grants for families were 640 acres each or one square mile, (half that amount for single men), initial settlement in Holford Prairie, now the Lewisville-Flower Mound- Highland Village-Lake Dallas area) was widely dispersed: Denton County contains but 953 square miles, enough to award grants to fewer than 1000 families. The ancestry of Huston Jackson Gray is not known. He was born about 1828 in Tennessee, and on 10 July, 1850 he married Aurelia Panthea Guthrie, a native of Alabama, probably from Elyton, now in Birmingham, Jefferson County. She was born about 1830 and was a daughter of Rev. James Smith and Letha (Burns) Guthrie. The Rev. Guthrie was an important evangelizing preacher in the Cumberland Presbyterian church. In the Federal census taken after the marriage, in the “Rusk District,” Rusk Co., in east Texas, Huston and Aurelia were living in her parents’ household, likely in the Henderson area. Later in the decade, Huston and Aurelia and their family, together with Aurelia’s brother, Robert B. Guthrie, removed to the northern part of Holford Prairie, in rural Garza, now Lake Dallas, .where in 1857 he and Guthrie (also of Holford Prairie) obtained title to 1680 ares in Dallas and Denton Counties from Perry Harmonson. Both brothers-in-law were farmers. It is very likely that he was raised in an East Texas Lodge, one might guess in Clinton Lodge #23, Henderson. In addition to being one of the founders of Denton (now Lewisville) Lodge, Huston Gray was WM in 1858 and 1859, and Senior Deacon in 1860. He fought for the Confederacy during the Civil War, in Co. G, Bourland’s Border Cavalry Regiment. He died 10 May, 1865, about three weeks before the surrender of the Regiment, 2 June, 1865; neither the circumstances of his death, nor his place of burial have been discovered. Huston and Aurelia had four children, Virginia Josephine, Letha Aim, William Newton and Sam Houston. In later life, Aurelia lived near Seymour, Baylor County (southwest of Wichita Falls) with her son Sam Houston and his family. She applied for a Confederate widow’s pension in 1899, died in 1908, and is buried in Old Seymour cemetery, Seymour. The Sublett family (Soblet) was of French Huguenot origin, from Sedan, in the Ardennes region of Northern France. The family fled to London after Louis XIV revoked the Edict of Nantes, 1685, and from there came to Virginia. the family gradually diffused across the Appalachian Mountains to Kentucky and Tennessee where Isaiah P Sublett, son of William Scott and Ann (Robertson) Sublett was born, 23 December 1827. On 25 September 1847, he married Susan F. Cawthon (June 1, 1822 – June 30, 1893) in Wilson Co, TN (near Nashville). By 1850, the Sublett family, Isaiah, his wife, Isaiah’s parents and siblings, removed, to Shelby County, in east central Texas, just north of San Augustine County, where William’s brother, Philip, had settled earlier. There Isaiah joined Newburn Lodge No. 97, petitioning on 29 October, 1854. He was initiated 25 November, passed 23 December of that year, and raised 27 January 1855. De demitted in July, 1855; the lodge to which he demitted (if any) has not yet been determined. The town of Newburn evidently no longer exists. The Subletts came to Denton County soon thereafter, probably attracted by the possibilities of land grants from the Peters Colony. They settled in the “Chinn’s Chapel” area, and, in 1860 obtained 160 acres just south of where the Double Oak Town Hall is now located, by patent # 63. Brother Sublett bought and sold land, and he and Susan had five children who survived childhood, Frances (1849, born Tennessee), Sarah (1851, born Texas), Susan (1854) John (1861) and Mary (1863). During the Civil War, Isaiah was a 2nd Lieutenant in Mounted Co. “C” 21st Brigade, Texas State Troops, servicing under Capt. Theodore J. Dorsett (first WP of Lewisville Lodge) and Brigadier General Wm. Hudson. The unit served briefly in Texas’ northwest frontier. He was described at 5′ 10″, fair complexion, 35 years of age and a stock raiser by trade. Since this unit was supposed to be active until Confederate troops took over, this latter event was not long in coming. Later, he farmed. 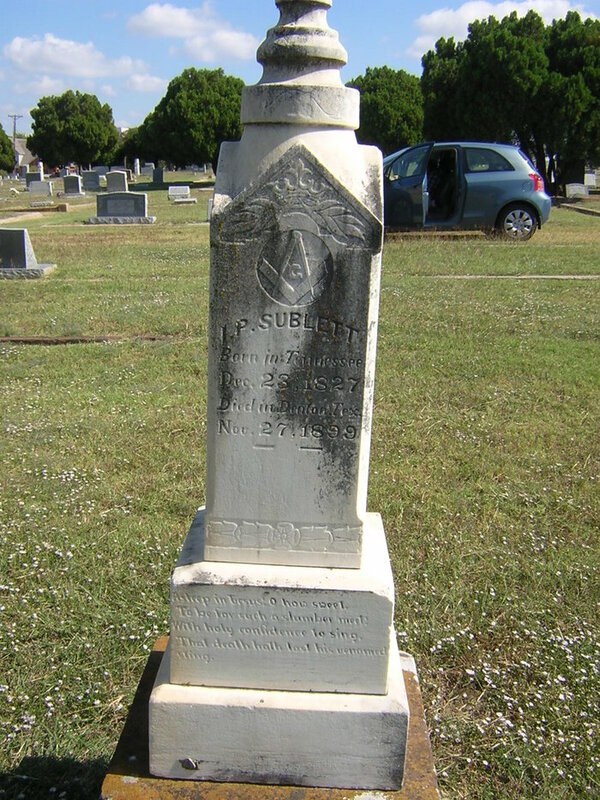 Brother Sublett was WM in 1862, 1863 and 1870. After his wife, Susan’s death, he remarried, to Mrs. M.E. V Prichard, 7 October, 1896. He died November 27, 1899 and he and his first wife are buired in the odd Fellows cemetery, Denton. The Sublett surname is entwined with the history of the Republic of Texas. Isaiah was a first cousin once-removed to Philip Allen Sublett, who served in pre-Alamo battles, at Nacodoches (1832), was in the San Antonio area for the Grass Fight, the Battle of Concepcion and the siege of Bexar in which the Texians defeated the Mexican defenders and their commander, Santa Anna’s brother-in-law, Martin Perfecto de Cos. it has been claimed (by a reliable source) that Sublett’s troops from San Augustine committed some depredations (looting) in Gonzales on the way to San Antonio, certainly possible since the town’s men were already at San Antonio. Sublett fought bravely once he got there. Philip A. Sublett had settled in San Augustine. By 1834 he was the municipality’s (second) judge. He may have been the one who determined that Theodore Dorsett’s family (he was Lewisville Lodge’s first WM) were suitable persons to live there. Phillip Sublett served in a number of important positions during the Texas Revolution and afterwards. He nominated his law parter, Sam Houston, to be the first President of the Republic. San Augustine has a rich Masonic history and is home of a very early Masonic Lodge charted in Texas (by the Louisiana Grand Lodge), McFarland, now Redlands Lodge No. 3. The Lodge’s founder, John Gillespie, was sentenced to death in Mexico, but was reprieved by the commander of the firing squad, a brother Mason, when he gave the Masonic sign of distress. As far as I have been able to determine, this is a true case of the use of the sign to save one’s life, unlike that for Santa Anna, now subject to question. “The Sublett House” built by his son Henery, in San Augustine, still exisits.